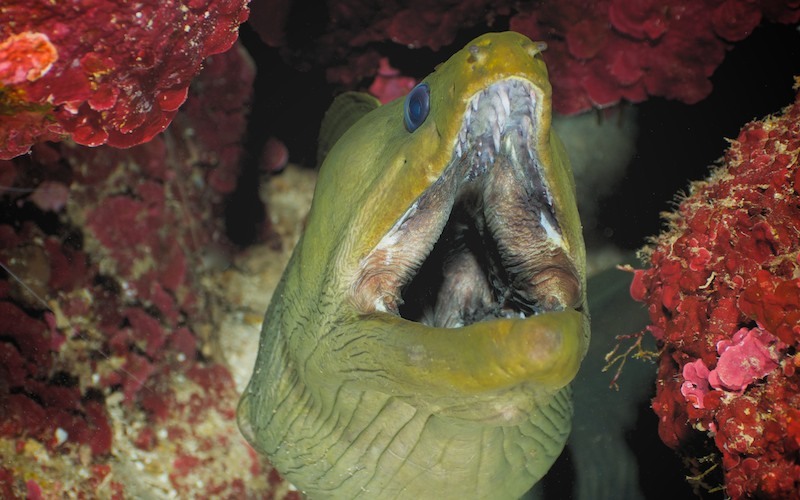 Caption: Moray eels are cosmopolitan eels of the family Muraenidae. The approximately 200 species in 15 genera are almost exclusively marine, but several species are regularly seen in brackish water and a few, for example the freshwater moray (Gymnothorax polyuranodon) can sometimes be found in freshwater. With a maximum length of 11.5 centimetres (4.5 in), the smallest moray is likely the Snyder's moray (Anarchias leucurus), while the longest species, the slender giant moray (Strophidon sathete) reaches up to 4 m (13 ft). The largest in terms of total mass is the giant moray (Gymnothorax javanicus), which reaches 3 m (9.8 ft) in length and 30 kg (66 lb) in weight.